A recent study conducted by the EDUCAUSE Center for Analysis and Research (ECAR) found that the average median age of IT professionals—including staff, managers and CIOs—is 50, and that almost one-fifth (18 percent) are at a high risk of leaving their current positions. With this dual threat of an aging workforce and rising attrition, institutions must find new ways to fill the growing gap in technical staff. Due to large budget cuts and a more competitive hiring environment, however, hiring IT personnel has proven difficult. Citing an estimated 0.7 percent unemployment rate among IT professionals in greater New York City, Brian Cohen, Vice Chancellor for Technology and University CIO for The City University of New York (CUNY) System, points out that this is only one of the numerous challenges to workforce retention and ideation that institutions face. 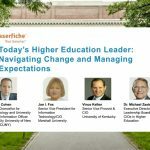 “We have an aging workforce that is considering retirement and a younger workforce that is considering their next opportunity,” says Cohen, in a recent webinar hosted by the Chronicle of Higher Education. 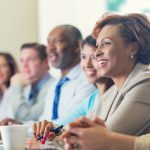 Managing a multi-generational team in this situation poses unique challenges, such as bridging the skills and experience gap between veteran workers and new hires. One strategy CUNY has employed successfully is providing students with internship and fellowship opportunities, which serves a dual purpose: Opportunities give students a head start on knowledge transfer and experience building while nurturing a talented pool of potential recruits for the university system. Cohen adds that CUNY has struggled to compete with IT salaries for government—and keeping pace with private industry pay is an even taller task. Marshall University, a West Virginia-based, private liberal arts college with over 13,000 students, addressed the problem of retention by providing an engaging and inclusive environment for its IT staff. Jan I. Fox, Senior Vice President for Information Technology/CIO at the university, states that by sponsoring cook-offs and other workplace networking functions, the university creates an appealing environment that attracts new employees and makes them feel part of a larger family. Marshall also includes its IT staff in executive discussions about campus technology initiatives—welcoming them to offer their feedback and expertise about the university’s IT agenda. At Texas A&M University’s (TAMU) College of Engineering, the innovation challenge was to cost-effectively increase administrative capacity to support “25 by 25,” an initiative to expand enrollment from 15,000 to 25,000 students by the year 2025. “Educational institutions’ budgets are always tight, so doubling our staff along with the enrollment growth wasn’t an option,” explained Ed Pierson, the college’s CIO. The College of Engineering discovered the solution through Texas A&M University System’s centralized IT office, which offers enterprise content management (ECM) as a shared service. By reengineering existing business processes and implementing ECM to automate and eliminate unnecessary manual work, the college was able to increase operational efficiency and alleviate the administrative burden on its staff. In particular, the adoption of ECM for employee onboarding allowed the college to hire 3,400 employees in just under a year. “IT is usually seen as a spender of money, but dollars invested in information technology can have a positive return on investment,” said Christopher Huff, the college’s Network Systems Administrator, who spearheaded the initiative. The implementation in the HR department alone led to savings of 2,600 staff hours or roughly $100,000.